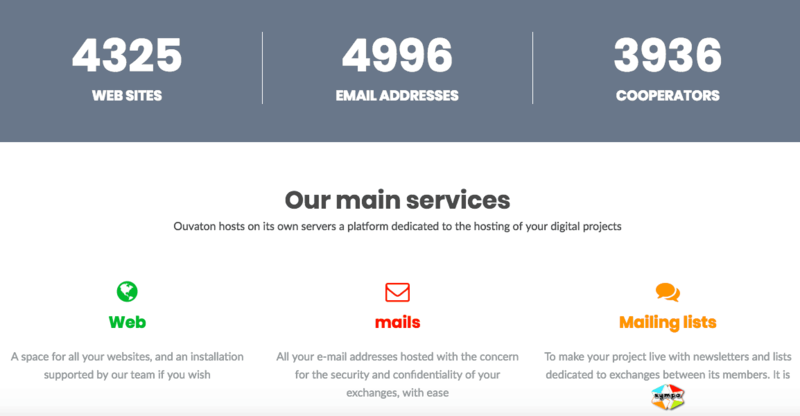 Ouvaton Review 2019: Is Ouvaton a Good Hosting? Ouvaton is a no-frills French provider with one basic, yet customizable plan. The company has a unique business model and forum-based customer service model. Ouvaton is a French hosting company which was founded in 2001. Since 2006, this company has been run as a cooperative, with nine board members. Currently, Ouvaton has nearly 4000 customers. The website is available in French. Ouvaton is unique in that it offers one package of shared hosting, which can be customized by adding on resources. The single plan can be customized by adding additional SQL databases, domains, and disk space. Considering that there’s only one plan, I was a little disappointed by the limited adjustments that can be made. Each add-on costs extra, however, what’s nice is that you only pay for the resources you need. Also, if you need larger volume or resources, you can contact Ouvaton for a bespoke offer. The plans run on both Windows and Linux operating systems, offer PHP support, and phpMyAdmin, as well as MySQL and MSSQL databases. To ensure your website is running optimally, there is SSH access and cron jobs. Getting signed up is slightly different from other companies. First, you need to register, which creates an account inside the “Ouvadmin”, and then all ongoing invoices and payments are handled from within this dashboard. Finally, while not technically related to the features or ease of use of the product, it’s interesting to note that this company is a co-op, run by board members and following a charter. On the website, you’ll find the general meeting notes and documents about the co-op’s values. The prices are very affordable, even when considering the cost of the add-ons. Make sure to note that if you overrun your resource allowance, you will be charged a rate ten times higher than purchasing the add-on for the equivalent amount of data. This seems strict, however if you purchase in advance of using the data, you’ll get a good deal. Plans are purchased in one year terms only. You receive an invoice each year which must be paid within 60 days of issue – there is no automatic payment. You can pay by check, transfer, or credit card, however, you are encouraged to do the latter. In terms of customer support, there are lots of help documents and a substantial forum as well as a ticketing system for support requests. However, other options are limited, to a contact form/ticket request on the website, which surprises me due to the cooperative nature of the company. Furthermore, I submitted a support request but did not receive a response. Ouvaton is basic hosting company with a fresh approach to its business model. If you’re the kind of person who wants to pick and mix a plan, paying for only the resources you need, the plans may work well for you. Buy affordable hosting now at Ouvaton! Wondering how Ouvaton stacks up against other Web Hosting companies? Enter any other Web Hosting company and we will give you a side-by-side comparison.